At the invitation of the Chinese government, Her Royal Highness Princess Maha Chakri Sirindhorn of Thailand will visit China from April 3 to 10. During the visit, Chinese state leaders will meet with Her Royal Highness and the two sides will exchange views on bilateral relations and issues of mutual interest. Besides Beijing, Her Royal Highness Princess Sirindhorn will also visit Shanghai, Jiangxi, Fujian, Hong Kong and Macao. China and Thailand are close friendly neighbors. Her Royal Highness Princess Sirindhorn, as a long-time good friend of the Chinese people, has made positive contributions to enhancing China-Thailand friendship and all-round cooperation. We believe that Her Royal Highness Princess Sirindhorn's visit will further consolidate the traditional friendship and the comprehensive strategic cooperative partnership between China and Thailand. Q: US Secretary of State Pompeo said that when China uses debt as a trap, engages in spying through its enterprises and poses risks through its technology companies, the US wants to make sure that relevant countries know about the risks and make their own decisions. What is your comment? 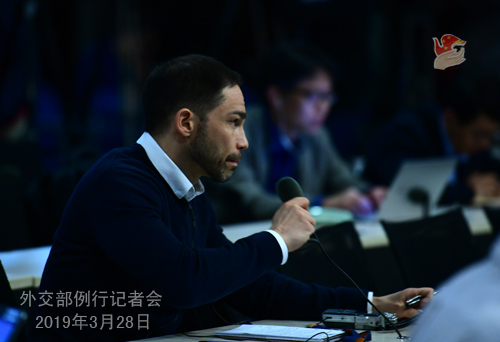 A: For some time, it seems that some US politicians cannot go anywhere without attacking China, tarnishing China's reputation, and sensationalizing the so-called "China threat". They frame China's development assistance as a "debt trap" and accuse Chinese enterprises of spying with trumped-up charges. These actions are extremely immoral and unfair. 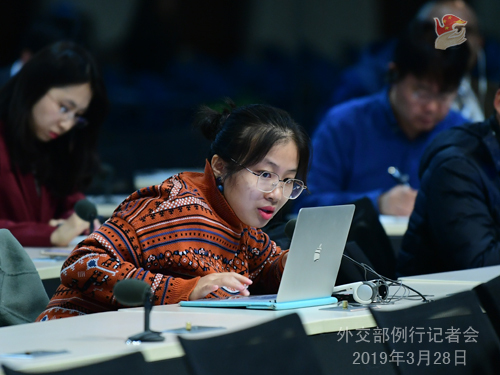 China has been carrying out cooperation with developing countries on the basis of mutual respect, equality and mutual benefit and has been providing assistance to them within its capabilities and with no political strings attached. Such cooperation has helped these countries achieve economic and social development and improved local people's lives and has been welcomed by them. The amount of debts they have incurred from cooperation projects with China only accounts for a very small proportion of their total debts, and no country has fallen into the so-called "debt trap" because of cooperation with China. The US allegations are not supported by facts. Such random smear campaign against China will get nowhere. China has been asking its enterprises to strictly abide by local laws and regulations when running their businesses overseas. Some forces in the US, driven by political motives, have been leaving no stones unturned in attempts to crush Chinese enterprises and peddle the theory that China is spying through its enterprises. They intend to cripple Chinese enterprises to serve their malign ulterior motives. But people see through their game. They are doing all these to defend their dominance in economy, science and technology. Their trick of a thief crying thief is doomed to fail. I want to stress that a lie, even repeated a thousand times, will still be a lie. Certain people in the US should not overestimate the effectiveness of their rumor-mongering or underestimate other people's ability to make informed judgments. We urge these people to correct their attitude, discard the the cold-war and zero-sum mindset, adopt an objective and accurate view towards China, stop slandering China, and do more to promote China-US cooperation, instead of the opposite. Q: So the US has circulated a draft resolution to UN Security Council to blacklist Masood Azhar. Given that China has vetoed past actions to add Masood Azhar to the sanctions blacklist, what is China's response to this recent draft resolution? A: I will need to correct you. China has not vetoed anything relating to this matter. We put a hold on the application and voiced a different view in the sanctions committee. It's something completely different from a veto in the Security Council. Follow-up: You are saying that China has never blocked actions to add Azhar to the sanctions blacklist? A: You are referring to the 1267 Committee. That and the Security Council, to which your original question is related, are two different levels. Follow-up: Can you then just comment on this draft resolution to the UN Security Council? A: The request to designate Masood a global terrorist was put forward to the Security Council 1267 Committee not long ago. 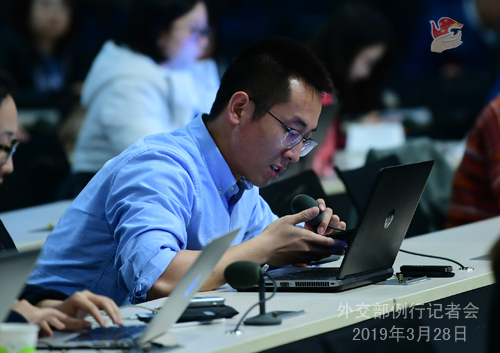 China has put a technical hold on the application as more time is needed for a comprehensive and thorough assessment. This is in line with the rules of procedure of the 1267 Committee and there are many such precedents. The Masood designation issue involves a series of complicated factors. China has noted that relevant parties have expressed willingness to conduct dialogue and consultation. China has also been promoting proper settlement of the issue through dialogue. Under current circumstances, the Security Council should act prudently and play a constructive role by allowing time and space for dialogue and consultation between parties concerned. The US is bypassing the 1267 Committee by putting forward its draft resolution directly to the Security Council. Such an act will do nothing to facilitate a solution through consultation and will only lead to further complication of the issue. It has undermined the authority of the 1267 Committee as a main counter-terrorism agency at the Security Council and is not conducive to upholding the unity of the Security Council. China urges the US to respect the will and efforts of parties to the issue and observe traditions of the Security Council to safeguard the 1267 Committee's authority and the Security Council's unity. We hope the US will by all means exercise prudence and refrain from forceful actions. Q: On March 27, the UK government issued its latest six-monthly report on Hong Kong. What is your comment? A: There is no denying the fact that since the return of Hong Kong, the practice of "one country, two systems" has achieved well-recognized success. I want to stress that since Hong Kong's return on July 1, 1997, Hong Kong affairs have become China's internal affairs. The British side has no right to point fingers at and shall not interfere in Hong Kong affairs under whatever pretexts. We urge the British side to face the fact squarely that Hong Kong has been back as part of China for 22 years, respect China's sovereignty, stop issuing the relevant report, and stop meddling in Hong Kong affairs. Q: Taiwan's President Tsai Ing-wen said yesterday that Taiwan was seeking new purchases of tanks and US fighter jets, and Washington was "responding positively". Do you have any comment on those developments? A: First I need to correct you on the title of Tsai Ing-wen. She is the leader of the Taiwan Region. The so-called title of "president" is never recognized by China. I am sure you know that very well. There have been many similar questions. Here I will reiterate our consistent, unequivocal and firm opposition to US arms sales to Taiwan. China has lodged stern representations to the US on this issue. We urge the US to fully realize the high degree of sensitivity and severe impact of this issue, honor its commitment to the one-China principle and the three China-US joint communiques, in particular the August 17 communique, stop arms sales to and military ties with Taiwan, and prudently and properly handle issues relating to the region for the sake of China-US cooperation in key areas and peace and stability across the Taiwan Strait. Q: After meeting with people who accounted "abuses" while being held in one of China's "reeducation centers" for Uyghurs, US Secretary of State Mike Pompeo denounced China's treatment of Muslims. I wonder if you could comment on this. A: The Xinjiang affairs are purely China's internal affairs. Xinjiang currently enjoys social stability, good momentum for economic growth and harmony among all ethnic groups. Residents there now have a much stronger sense of security and fulfillment. Xinjiang has taken preventive measures by setting up the vocational and educational training centers for counter-terrorism and de-radicalization purposes. Such lawful measures have been endorsed by people of all ethnic groups and delivered social benefits. Facts speak volumes that the vocational and educational training centers are by no means the so-called "reeducation camps" painted by the US and other Western countries. 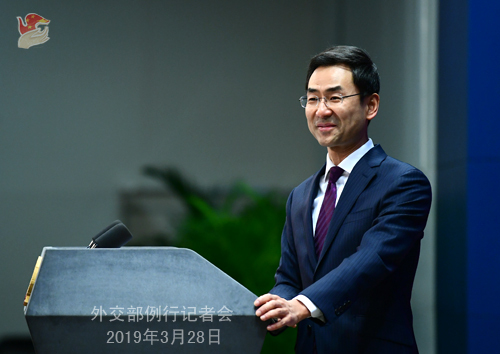 China deplores and firmly opposes the absurd remarks made by some US individuals on Xinjiang, which constitute gross interference in China's internal affairs. We have made stern representations to the US side. China never accepts the false accusations and slanders made by the US against the Chinese government and its Xinjiang policies. Once again we urge the US to respect the facts, abandon bias, exercise prudence in its words and deeds, stop tarnishing and making unfounded accusations against China and using Xinjiang-related affairs as tools to interfere in China's internal affairs, and make efforts to enhance China-US cooperation and mutual trust instead of the contrary. Q: Protesters at a Chinese copper mine in Peru have turned back senior Peruvian officials by throwing rocks at their helicopter yesterday. The officials had hoped to restart talks with those indigenous leaders there who said their village was relocated to make way for the mine. Does China take any responsibility for this standoff? A: I will need to check for more information regarding the specific situation you mentioned. As a principled response, I would like to point out that the friendly and mutually beneficial cooperation between China and Peru helps improving people's well-being and boosting local economic and social development. An enabling business environment is a necessity for such cooperation to prosper. The Chinese government has all along asked Chinese companies investing overseas to comply with local laws and regulations and shoulder their social responsibilities. When problems arise, efforts should be made to seek a proper settlement through friendly consultations.